Aspergillus is a genus of ubiquitous fungi that are therapeutically important because the genus produces a wide range of structurally diverse secondary metabolites that are of highly considerable interest to both scientific research community and pharmaceutical industry. Genome sequencing results have indicated that chemical diversity of secondary metabolites is much larger in each species than previously thought. 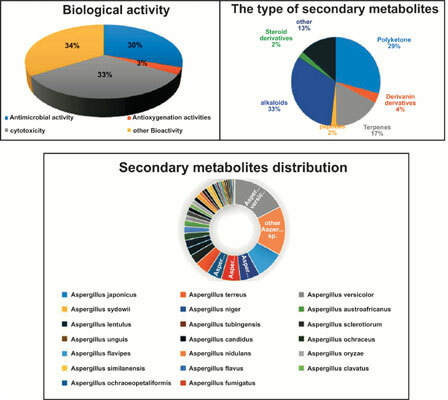 This review summarizes a total of 315 new secondary metabolites of Aspergillus reported from 2015 to 2017 and demonstrates the therapeutical potential of this genus by introducing their unique chemical structures and excellent bioactivities from this genus. Aspergillus, secondary metabolites, structure, biological activity, ubiquitous fungi, genome sequencing.